Most of the Author's male ancestors were lead miners in Middleton-by-Wirksworth, back to 1594. What did they wear? Most books of clothing down the centuries show the fashions of well-off people, not workmen. This email from Margaret Howard shines a light in a dark place. 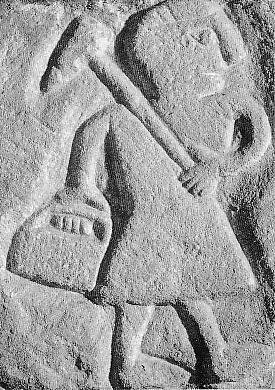 He seems to be wearing a leather coat and a brimless leather hat, carrying a Gadd on his shoulder, and a whisket in his hand. Boots with a nailed sole were worn. A day's work produced about 80 pounds of ore and earned him 5 pence. I thought that you might like the following snippet concerning the type of clothes that lead miners wore and the type of food they ate. It is extracted from page 24 of "Derbyshire Lead Mining" by Nellie Kirkham published in 1968 by D. Bradford Barton Ltd.
"Few records remain of the type of working clothes worn by miners, but often they dressed in leather, such as calfskin, with a leather cap on which they stuck a blob of clay to hold a candle. In the nineteenth century canvas trousers with flannel clothes and caps, which became stiffened with clay, are mentioned. Boots, probably dating from last century, have been found in some mines, having an iron band round the welt with a nailed sole. In one case a brimless leather cap was found, as described by Daniel Defoe in 1724. This writer describes a miner climbing up a narrow shaft carrying tools in a little basket which contained three-quarters of a hundred weight of ore, having worked three hundred and sixty to four hundred and fifty feet below ground, earning 5d. a day. His wife was paid 3d. a day for washing ore. A felt hat called a Bradder hat was worn - the prototype of the tin helmets of World War 1. The miners smoked a good deal; clay pipes of all sizes, types, and dates from Elizabeth 1, turn up endlessly on the hillocks as well as underground. General evidence from various sources seems to indicated that in his food the miner fared like the Derbyshire countryman, eating oat bread, with cheese and bacon and milk of his own produce, but that a year of bad harvest, or the loss of a cow or a pig, was a major disaster. The miner always had at least a small piece of ground, a cow or two, and a field of oats. A number of references state that he drank a good deal of ale, one visitor to a Wirksworth mine in the 1680's being 'well treated with good ale, besides good beef and bread' by the miners. At this period there was 'transcendant Derby Ale,' while in Wirksworth in 1695 there were three innkeepers and thirty-seven ale-houses." Nellie Kirkham died in May, 1979 before the days of the internet. She was only too pleased to pass on her knowledge of Derbyshire's lead miners and it's mines to people interested in the subject, so I'm sure she would have been pleased for me to pass this information on to you.